Today was the second day of Ramadan, and we had our support group sessions with families and siblings at the center. This morning we started at 9 am to prepare for the activities we did with the parents and the siblings today. We also spent some time planning for our cooperative sessions tomorrow to prepare appropriate activities for the families and their children. This afternoon we had the parents and the siblings of Reema, Ali, Haya and Amjed. In the parent support session, our main activity involved dividing into pairs, and having each person in the pair choose to be A or B. In each pair, A tells B about he thinks is the greatest idea in the world for 4 minutes. B’s role is to listen to A carefully without making comments. After A finishes, B has 4 minutes to tell A why this idea is the greatest idea in the world by saying “This is the greatest idea I’ve ever heard!”, and starts listing the things he liked about A’s idea. After that, A gets to talk again about his idea for 4 minutes; adding more details into it and elaborating. After B listens carefully to A, he gets another 4 minutes to tell A why this idea was the worse idea he ever heard. After finishing the first round, we switched the roles between members A and B. So, member B talked about his ideas, and member A gave positive then negative feedback. We asked each member how they felt after listening to someone giving positive feedback about their ideas. The parents loved it. Reema’s mother said that she never thought her idea was so great until she heard Amjed’s mother telling her how amazing it was. On the other hand, we also asked them how they felt hearing negative comments about their ideas. Haya’s mother said that it felt depressing and made her think that her idea was very silly to talk about. This activity aimed to give parents insights on how our positive and negative comments and feedback might affect children with autism. Negative comments might be discouraging, so we try to catch their strengths and encourage it instead of pointing their weaknesses and give negative comments. We had some unexpected young siblings in the sibling group today, so Hana and Melissa changed the plan to introduce activities that were more appropriate for younger children. One activity they did with the siblings today was the game ‘the copycat’ or ‘guess the leader’. In this game, they asked each child to leave the room once. Before he comes back, the remaining group of children decide on a leader to follow to do specific movements in front of the child who was outside, and this child has to come back in the room and guess who the leader is. Another activity they did involved having the children teach each other how to build a specific tower of Legos without speaking. To get the siblings excited for next week’s support session, Hana and Melissa asked them to teach their siblings with autism a skill they would like them to acquire at home and to make a video about it to share with the group next week. After we came back, we brainstormed some solutions to the childcare challenges that some parents are facing in our program. While doing this, we practiced our “best idea I’ve ever heard” mentality to figure out what would work about each of our proposed solutions. 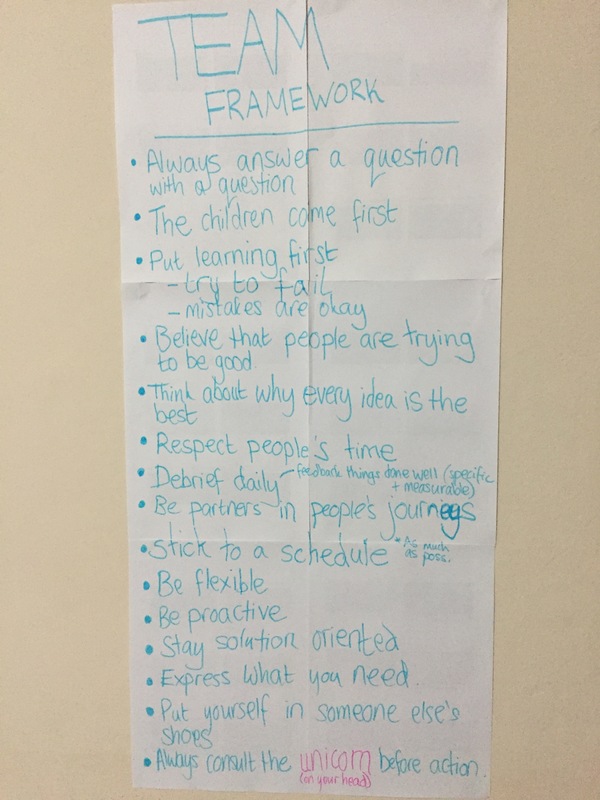 We also created our team framework and hung in up next to the quote board in our living room. We ended the evening with a feedback session and a discussion about reinforcement within our team.